მხრის წნულის დაზიანება და სხვ. ზ.ა. ავადმყოფობები და სინდრომები იწვევენ პერიფერიულ მტკივნეულ ნეიროპათიას მიუხედავად იმისა, რომ მათი უმრავლესობის დროს დაზიანების გავრცელება სისტემურია. ნეიროპათიული ტკივილის მართვა საჭირბოროტოა - შეუძლებელია მკურნალობის წარმატების წინასწარმეტყველება. ხშირად ხელმისაწვდომი პრეპარატების არასრულფასოვანი კლინიკური ეფექტურობა დამატებით ტვირთად აწევს ნეიროპათიული ტკივილით შეპყრობილ ადამიანებს. სტიმულების განმეორებისას ხდება მათი არანორმალური ზედდება, რაც ხელს უწყობს ტკივილის ინტენსივობის ზრდას. წყარო: Haanpää M, Treede F-D. Diagnosis and classification of neuropathic pain. IASP Clinical Updates, 2010, 18:1–6. არანორმალური მგრძნობელობა (თავისთავადი ან გამოწვეული). უსიამოვნო შეგრძნება (თავისთავადი ან გამოწვეული). შეხების ან/და ტემპერატურული გამღიზიანებლის შეგრძნების შემცირება. შეხების ან/და ტემპერატურული გამღიზიანებლის შეგრძნების მომატება. ტკივილის შეგრძნების შემცირება ჩვეულებრივი ტკივილის გამომწვევი სტიმულის საპასუხოდ. ტკივილის შეგრძნების მომატება ჩვეულებრივი ტკივილის გამომწვევი სტიმულის საპასუხოდ. ტკივილის აღმოცენება ჩვეულებრივად ტკივილის არაგამომწვევი სტიმულის საპასუხოდ. 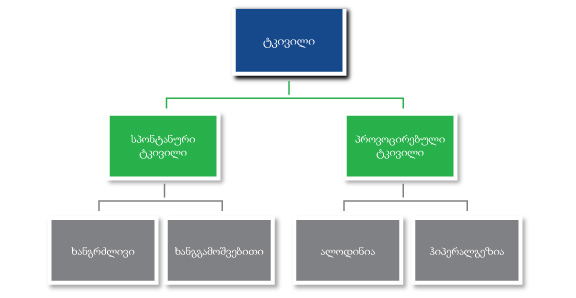 წყარო: Merskey H, Bogduk N, editors. Task force on taxonomy of the International Association for the Study of Pain: classiﬁ cation of chronic pain. Description of pain syndromes and deﬁ nitions of pain terms. Seattle: IASP Press; 1994. p. 210–3. წყარო: Hansson P. Nociceptiv och neurogen smärta. Uppkomstmekanismer och behandlingsstrategier. Pharmacia & Upjohn Sverige AB;1998:63.
ნეიროპათიული ტკივილი ფართოდ გავრცელებული ავადმყოფური მდგომარეობაა. თუმცა, მისი ავადობა (ინციდენტობა) ფართოდ შესწავლილი არ არის და საფიქრებელია, რომ ნეიროპათიული ტკივილის უმრავლესობა უდიაგნოზოდ რჩება. შენიშვნა: აღნიშნული მონაცემები არ ასახავს აივ-ნეიროპათიის შემთხვევებს; სავარაუდოდ, იმის გამო, რომ აივ ინფექციის დიაგნოზზე და მკურნალობაზე პასუხისმგებელნი არიან არა ზოგადი პროფილის, არამედ სპეციალურად ამ ავადმყოფობაზე ორიენტირებული პროფესიონალები. სურათი გვიჩვენებს ნეიროპათიული ტკივილის გავრცელებას ნიდერლანდების პირველადი ჯანდაცვის ერთი მონაცემთა ბაზის მაგალითზე. პოპულაციური კვლევაში ჩართული იყო 362 693 პაციენტი; პაციენტზე დაკვირვების პერიოდი - საშუალოდ 3 წელი. ამით შეიძლება აიხსნას ის ფაქტი, რომ შაქრიანი დიაბეტით გამოწვეული ნეიროპათია ნიდერლანდების მონაცემთა ბაზაში პერიფერიული ნეიროპათიის გამომწვევ მიზეზთა შორის მესამე ადგილი უკავია. ნეიროპათიული ტკივილის სხვა, არანაკლები მნიშვნელობის, მხარე არის ეკონომიკური ზემოქმედება. კვლევებით გამოვლინდა, რომ ნეიროპათიული ტკივილით დაავადებულ ავადმყოფებს სამედიცინო დანახარჯები სამჯერ მეტი აქვთ, ვიდრე მათ, ვისაც მტკივნეული ნეიროპათია არ აღენიშნებათ [Gilron I, 2006]. პაციენტები ნეიროპათიურ ტკივილს ამგვარად ახასიათებენ: “გამკრავი”, “მჩხვლეტავი”, “შეტევითი”, “მწველი”, ”მტანჯველი”, ”დამაუძლურებელი”, ”დამქანცველი”, ”გამომფიტავი” შეგრძნება. დეპრესია ზრდის ნეიროპათიული ტკივილით გამოწვეულ ფსიქოლოგიურ და ფიზიკურ ტვირთს. კისრის და წელის ტკივილის დროს. Bouhassira D, Lanteri-Minet M, Attal N, Laurent B, Touboul C. Prevalence of chronic pain with neuropathic characteristics in the general population. Pain 2008; 136:380–387. Torrance N, Smith BH, Bennett MI, Lee AJ. The epidemiology of chronic pain of predominantly neuropathic origin. Results from a general population survey. J Pain 2006; 7: 281–289. Treede RD, et al. Neuropathic pain: Redefinition and a grading system for clinical and research purposes. Neurology 2008;70(18):1630–1635. Jensen TS, et al. Pharmacology and treatment of neuropathic pains. Curr Opin Neurol 2009;22(5):467–474. Dworkin RH, O'Connor AB, Backonja M, et al. Pharmacologic management of neuropathic pain: evidence based recommendations. Pain 2007; 132: 237–251. (class I SR). Gilron I, et al. Neuropathic pain: a practical guide for the clinician. CMAJ 2006;175(3):265–275. Dieleman JP, et al. Incidence rates and treatment of neuropathic pain conditions in the general population. Pain 2008;137(3):681–688. Duby JJ, et al. Diabetic neuropathy: An intensive review. Am J Health Syst Pharm 2004;61(2):160–173. Schmader KE. Epidemiology and impact on quality of life of postherpetic neuralgia and painful diabetic neuropathy. Clin J Pain 2002;18(6):350–354.